The Sahara Hotel and Casino in Las Vegas opened its doors in 1952 and quickly became one of Las Vegas' most exciting destinations. The Sahara offers 1,720 classically styled guestrooms and Las Vegas suites decorated in a Moroccan motif. 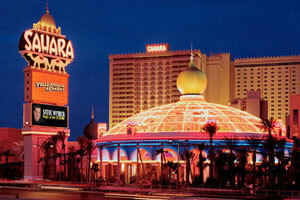 The Sahara Hotel and Casino offers a classic Las Vegas experience with modern amenities. It's only three miles from the Fremont Street Experience and five miles from McCarran International Airport. Click here to submit a credit application for this resort!